I have settled on a light fixture for the great room in the house. Three of these nineteen inch pendants will be hanging in between the high beams in satin nickel. Best part is that Restoration Hardware is having their lighting sale until October 18th on ALL lighting. Take advantage if you are looking to get any of their fantastic pieces. Another tip that I learned is that you can lock in that price for 90 days without actually having purchased it yet. So if you are in a bit of a pinch for the cash right now, you can call before the 18th of October, place your order, then call back within 90 days to be charged and have them shipped. This worked great for me this week since we placed the carpet order and painted this week for the basement. Almost done! Here is to a weekend of lots of little surprises that make your day better. 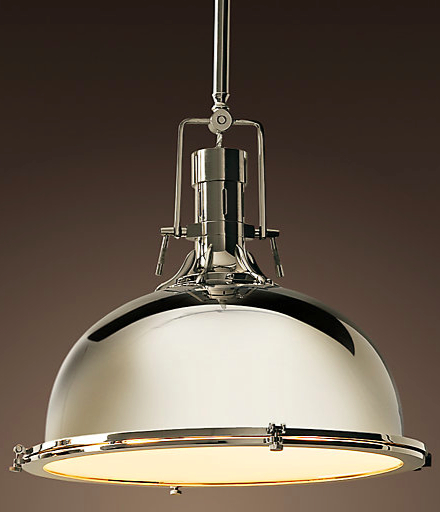 Curious where you purchased the flush mount polished chrome light fixture? It is from Restoration Hardware. 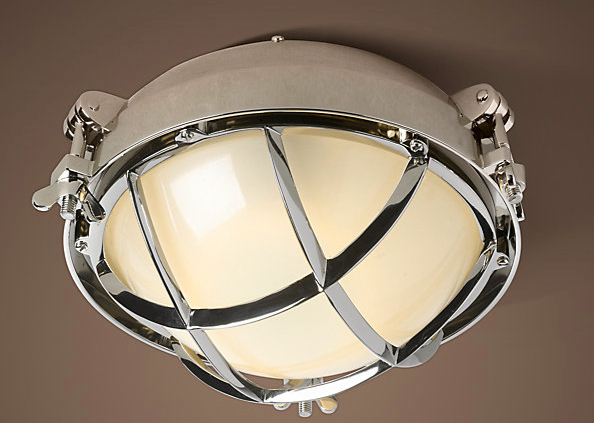 Shades of Light also has some great flush mount options as well.